"Lets us acquire data quickly and easily"
I like the simple functionality and overall design of the interface. I don't need to have much of a technical background in order to get this form system up and running effectively. We basically move fields into place exactly where we want them to appear in the form. That makes it easy to figure things out as we move along. We can instantly see how a form looks and make changes right away, if needed. The price is very reasonable and much lower than if we were to create forms from scratch with web hosting databases, PHP and HTML code. and functionality changes, it would probably be difficult in this platform. Though we can add a good variety of fields and data, there isn't much room for detailed style adjustments. I think Zoho Forms is a very versatile tool that can be used effectively for fast and simple deployment of professional business forms. If you don't already have a solution in place and aren't incredibly knowledgable about programming and web design, then I think Zoho Forms is a very reliable and affordable online form solution. We've used Zoho Forms as a quick and secure platform for creating and hosting professional business forms online. We can cut our work time dramatically by simply adding and editing fields with their straightforward form creation tool. We have been able to obtain large amounts of quality feedback from leads and current clients. We have also used Zoho Forms to compile team data regarding project activities. "A powerful online tool for processing forms and collecting data"
The layout of the Zoho Forms control panel is clean and easy to navigate. The instructions for each of the features are straightforward and don't take long to figure out. Getting signed up and started with a form only takes minutes. The quality of the form is professional and good enough for most business purposes I've used them in. There are many different uses for the forms, so it's a quite versatile platform. 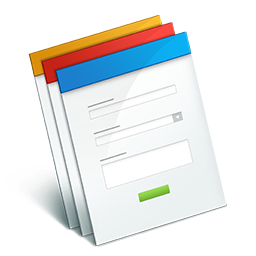 Zoho Forms has many nice templates for forms like contracts, registrations and surveys. Customizing the forms can't be done with a great deal of precision. Though it's great that we can add certain branding elements, we can't format the form design in ways that would make it mesh better with our other business content. Even if your current needs for online forms are limited, you should explore the many templates and form samples to give you ideas about data to collect that you may not have considered before. The data could be valuable for service analysis and future marketing efforts. Zoho Forms has been a flexible and valuable platform for collecting many types of business data. We can get client feedback, create sign up forms, poll internal staff and more. We've actually used Zoho Forms in many ways that are beyond what we initially intended to use them for. We can save time and process form more efficiently by allowing users to add digital signature and submit forms online instead of through paper, fax or mail. I like the alerts and the ability to easily collaborate. The mobile app is great for keeping up with what is going on when on the road. Storage of docs is easy and secure. It is simple to create a new form and the formulas are all there fro Spreadsheets. Sharing docs is also nice and makes being out of the office a breeze. I would like to see more templates for project management. Also some different templates such as dashboards and risk management/issue tracking. There is times were I was not able too sync the mobile app with the server. This only happened a few times. I don't really have to much to share here, Just make sure you look into things and understand what purpose you are solving by using this software. "A dynamic form generation and management solution"
A feature that really stands out in Zoho Forms is the ability to connect many people to it for collaboration purposes. We can assign varying administrative roles to manage approval workflows. There are many different templates and adjustment options to fit most of our needs. We can add a multitude of data collection fields that go beyond the standard static web forms. The fields can adjust (for instance, hide or appear) based on responses to questions. I think the collaborative aspects of Zoho Forms can make things more complicated than necessary at times. Even though the intentions are good, one approver's absence can hold up the workflow and delay the launch of a form. Though you may not know exactly how you'll use Zoho Forms, I think that over time, as you explore templates and case studies, you'll be able find valuable ways to use it for a wide variety of purposes. We have been able to collect valuable data through the forms generated by Zoho Forms. That data can then be exported into other platforms for further analysis and to enhance decision making. We've used forms externally for marketing and registrations and also internally to collect survey data from team members about projects and the status of various tasks. We can add a substantive call-to-action to social media posts and other online and offline content by adding links to our forms to encourage submissions. "Best way to create whatever form you need"
It's easy to use yet very complete and with a lot of useful features like formulas, file upload, etc. As everything with Zoho, it's cloud based so you can work on your forms wherever and whenever you want. Moreover it syncs easily with my Zoho CRM so I don't need to copy paste answers into my clients records. Honestly, as for now, I didn't need ant feature that wasn't present. Maybe more themes for the looks but it's not very important and you can create your own themes. I needed to create a form for my clients in order to know their need for a service I've recently implemented. With Zoho Form I was able to create a form very quickly and to sync it with my Zoho CRM so their answer is directly sent into their CRM record. "Easily Push Website Forms To Contacts"
Zoho Forms can be easily built from within my Zoho CRM. I can ask for any field information whether it's a lead or contact and built a customized form in a couple minutes. Forms can be made to capture information for any CRM field group that I want for that specified offer. Whether I'm offering an eBook, Webinar, Report, Newsletter, Solution, Product, etc. a new form specific to the offer can be made easily, and added to any webpage quickly. The need for developer technical assistant to build simple widgets is almost extinct! The style and beauty of the forms can be upgraded with more features to point and click good design. If there were more prebuilt designs like you get in Canva, I'd be a lot happier with this product. Building webforms directly out of Zoho CRM saves a lot of integration time and switching from software to software. As a freelancer growing into a valid business complete with systems, tools and people is a big challenge. So to afford to pay other freelancers while I'm freelancing is difficult place to be. With better software I'm able to spend less on hiring professionals for projects and get more out of my tools so that I can continue to grow my freelancing business by reinvesting into it. Saving money from paying the wrong people to get a job done is a big challenge, not one you'll experience in a larger business with enough people or cash to get jobs done well and quickly. "The easiest professional form database we have used"
The ease of setting up forms using Zoho is incredible. Integrating into a Wordpress platform is also very user friendly. Subscribing to Zoho services can be confusing, but otherwise the platform offers a substantial amount of resources for free. We have integrated several forms using the free option on Zoho. The free subscription offers a substantial amount of solutions, so don't jump into purchasing a plan until you have tested the free membership first. We required a form solution to receive submissions for a number of opportunities within our company. Zoho Forms allowed us to create a custom form solutions for each opportunity and easy integration into our Wordpress websites. We were also able to email direct links to the forms for faster submission results. The ability to review submissions was consistently user friendly. "A concise and straightforward online form builder with helpful account features"
First and foremost, Zoho Forms makes it relatively easy to create sleek and professional forms without the need for coding experience. The layout and interface of the Zoho Forms account is clean and easy to navigate. We can create and edit forms in a very visual and intuitive way by essentially moving fields wherever you want them in the form. Aside from being a great form creator, Zoho Forms also has solid data tools that let us access and analyze data in the cloud. I think working with more complex forms can be a bit tricky. The pricing is not too bad, but seems to be somewhat on the high side. Though the customer support team is responsive, they aren't always the most helpful when it comes to figuring out issues with our specific forms. They've often just given me general information that I wasn't able to completely fix my problems. I would recommend using Zoho Forms for a wide array of business purposes. I think many companies might start out using these forms for certain things like surveys or reservations, but over time they may find that they can use them for a multitude of other purposes. You might find that you can faze out other services by replacing them with forms made with Zoho Forms. Also, I'd suggest using the Zoho Forms templates as sharp starting points for your forms. Zoho Forms has been a solid platform for online form creation. We are able to quickly post forms that we can use for customer feedback, purchases or many other types of data collection. Since Zoho Forms can integrate with other software and payment services like PayPal, it has been very versatile for many business applications. We can easily link to the forms from social media, emails or our website. "Stay connected with your field force and end-customers via Zoho Forms"
Zoho forms has abundant features which help you build and share forms, gathering critical information and streamlining the operations while your team is on field or at customer location. (1) It requires only drag and drop to create a form and the data will be stored on the cloud. (2) It provides the advance analytics where you can view statistics like error scores, bounce rate or conversion rates etc. (2) To reach a larger audience base, user should have the option of multiple languages to design a page. But Zoho Forms has limited number of languages available. It's a great tool to coordinate with your field force, assigning tasks to them, gathering proof of task completion and customer feedback on real-time basis. It really helps you streamlining everything on real-time basis. In our B2B business, we send our account managers to client locations to provide product training etc. To assign the jobs to the account management team and gather the customer feedback about the product training, we use Zoho forms. It has helped us in managing our account management team efficiently and improving training process after analyzing customer feedback. "No coding, no clutter- What a cool form builder"
Designing online form is very simple with Zoho form builder. It's takes only drag & drop. (1) It works seamless on all kinds of devices- desktop, laptop, tablets, mobile phones. The ease of use is same & the best on every device. (2) You can customize your own themes. (3) Once created, you can share your form across social platforms or your website by embedding on your webpage. (4) You can analyse your form's activity. Page-views. Entries. Error Scores, Conversion rates analysis helps you designing better forms in future. (1) This tool provides email notification for each changes/update/activity on your form. This becomes an information overload in your email account. (2) To make the form more interactive, you can use branching & can specify conditions. But it's little cumbersome for non-techie. (3) Number of languages to create form is less. At present, this is one of the very light, simple and professional tool to design online forms. After using it for 1 year, I can happily say that results are very satisfactory. I n a B2B business, we have visitors/prospects who may like to contact us. We have created 'contact us' form using this tool. Apart from this, we have existing clients who use our technology products. So we take feedback and we have created evaluation forms using this tool. This tool has helped us designing more professional, simple forms which has helped us in better customer acquisition & retention ratio. The Zoho Forms has come a long way in working well with the CRM and being useful for many purposes. It has been a great resource for us to gather data for our system and about our clients so that we can make sure to follow up accordingly. I like that we can make is dynamic as well as design it the way that we want to for our own company branding. I dislike that there are hidden "limitations" that you don't really know about until it affects the customer. The system pushes new leads into the system 99% of the time, but not always which also causes frustration. I think it has the ability to be very clean and useful for the majority of your needs. We are having all our clients apply through Zoho Forms, as well as have created several landing pages on the website with forms which has been extremely helpful. "Puissant, efficace et facile d'utilisation"
Un formulaire avec possibilité de téléchargement d'images, sans écrire aucune ligne de code ! "A tool heading on the right way"
Zoho forms its a nice tool i you want to create a fast form to get visitors informations on your website, it very easy to use and it haves a very intuitive UI. Still need some improvements on the integrations and also on the auto response emails. Zoho haves a lot of tools that can help you, zoho forms its one of them, although it still needs some improvements, they are moving on the right direction. If you already use any other Zoho tool then you should definitly use Zoho forms. We use Zoho forms to retrieve user information on downloads of ebooks, whitepapers etc. "Great IF you use Zoho CRM and other Tools"
Not a lot of flexibility with the look of the form. They have themes, but if I want to adjust columns and put two to a column, etc it requires changing the HTML a little, which if you're not fluent in HTML you shouldn't be doing. "Zoho forms super easy to create forms!" I love that Zoho Forms is super easy to use and create form even within their iOS-app! The only thing Id like to see improving is the ability design the forms more freely for webpages for example sometimes I would like to make a design better suited for a page. Easy to use! Easy to like! We set up forms for client meetings etc, that way we ask the same questions at all time to all out clients and make sure we cover everything thoroughly. "Get data from your customers"
Excellent drag and drop builder forms. It is very easy to create forms and share them by a massive email manager or social networks. It is very good to assign tasks and track them thanks to instant notifications that you can receive anywhere from your cell phone. It is excellent but the paid versions are a bit high. Zoho needs to add the one in a package. "Zoho Forms- very simple and effective"
I know there are a ton of simple forms available. But i simply like this one the best! Very simple, super easy to learn and very effective. - I wish the form would be exported to CRM as a separate document rather than only linking to the CRM fields. - exported form data could be better looking pdfs and emails. it is a very user friendly tool and if you are a Zoho CRM user, this one is a grat fit! we use it as an Intake form for our students and it is so simple and effective in capturing data. Very easily I can create short forms to get quick answers and analyze the doubts of the clients to filter it with the required service. "Great way to integrate forms to your campaign "
So easy to use and to build forms. The reporting function was key to tracking data returned from the forms. Nothing...loved it! Rarely do I ever say this but it was a well thought out product. "They gave me a Great customer assistance when I needed." have a lot off of apps , the sales performance and multichanel are really good. when you want to create an invoice isn't flexible , that's why sometimes we use quickbooks. "Zoho forms and CRM platform"
The forms are very easy to use and have an easy interface. There is a nice variety as well to help build your companies customer relationship management. I wish they had more templates to choose from. You can modify the templates, but it would be nice to have the ability to find the template you need without having to make a lot of modifications. "Easy Forms for my website"
I love that I can use this form to collect order inquiries from my website for my bakery business. It’s simple to set up. I wish they offered more designs for these forms and didn’t charge for custom features if you use more than one of their products. Collecting information for order inquires on my website. upload features, formulas and conditional field show feature. Not able to send emails as I wish. Not able to set pages, response based page navigation. * We monitor all Zoho Forms reviews to prevent fraudulent reviews and keep review quality high. We do not post reviews by company employees or direct competitors. Validated reviews require the user to submit a screenshot of the product containing their user ID, in order to verify a user is an actual user of the product. Hi there! Are you looking to implement a solution like Zoho Forms?